At Western High School, where heat is only partially working this week, “teachers are struggling to teach and students are struggling to learn,” according to senior Maia Washington. Frigid temperatures meant students like Washington all across the city returned from break on Tuesday to chilled classrooms often barely above freezing. On Tuesday and Wednesday, four schools were closed, and many of the schools that remained open operated with no heat or limited heat. In a statement emailed to the Beat on Tuesday, Baltimore City Schools’ Manager of Public Information Edie House Foster wrote that the school system had been monitoring the school’s heating systems, but the extreme cold caused additional problems. Like so many issues in Baltimore, the problems with school heating are well known and represent another effect of the divestment in city schools. Senator Bill Ferguson took to Twitter to point out that seven schools “requested HVAC/boiler facility repairs for funding and were denied due to ‘fiscal constraints.’” Ferguson also highlighted Maryland Governor Larry Hogan’s longstanding claim that “enough money has gone to Baltimore City” (state calculations say that Baltimore schools are inadequately funded by nearly 20 percent). Cin’Shea Williams, a junior at Western High School, characterized the climate at Western on Tuesday as a combination of denial and desperation. She said that the school’s plan that day was to insist that “warm air [was] coming out of the vents” and encourage teachers to “turn on the fans” in the ventilation system to increase circulation of the limited heat. 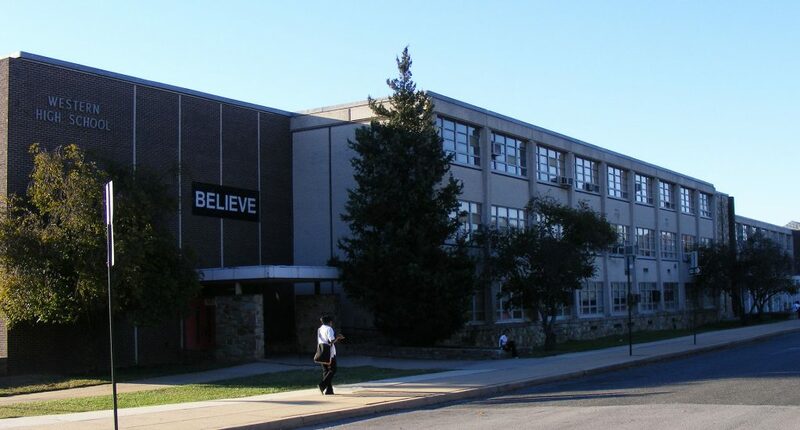 The Baltimore Brew reported that at Frederick Douglass High School, “flooding from a burst pipe had rendered one classroom [there] unusable,” and an image of the school’s wrestling room tweeted by a Douglass teacher showed extensive flood damage in rooms throughout the school. Vince Tola, who teaches English for speakers of other languages (ESOL) said Patterson High School also had pipes burst and a number of classrooms nearing freezing temperatures. At Matthew A. Henson Elementary School, teachers and students wore coats and jackets and dealt with power outages in the area, all while trying to learn. “Teachers and students are doing their best to manage the situation, however it’s simply too much,” said Nicole Chang, Baltimore site director for Huddle Up and co-founder of Our Legacy Inc., both nonprofits that work with public schools. Chang was at Matthew Henson on Wednesday. There is now a Facebook event tied to the meeting called “Too Cold To Learn,” organized by Brittany Oliver and the advocacy group Not Without Black Women. On Wednesday, the Baltimore Teachers Union hand delivered a letter to city schools CEO Dr. Sonja Santelises demanding schools close until heating issues are resolved. “Our educators have been forced to endure teaching in classrooms with dangerously low temperatures, instructing students who have been forced to try to learn bundled up in coats, hats, gloves. Trying to provide stable learning environment in these extreme conditions is unfair and inhumane, to say the least,” the letter reads in part. The Beat reached out to BCPS for comment and will update when we receive one. In a live video posted to the City Schools Facebook page late Wednesday afternoon, Dr. Santelises explained that in keeping schools open she was taking into account the need for safety and food access the schools provide to students who may not find it elsewhere.